as Mediolanum c. 396 B.C.E. Milan (Italian: Milano; Western Lombard: Milan) is the capital city of the Province of Milano and of Lombardy region (Lombardia) in northern Italy. Milan was first settled more than 2500 years ago. Over the centuries it has been controlled alternately by Celts, the Roman Empire, Visigoths, Huns, Ostrogoths, Longobards, the Frankish Empire, the French, Austrians, and Spanish, and others. The city was important for the history of Christianity as the site of the proclamation, Edict of Milan, in which Emperor Constantine I in 313 C.E. guaranteed freedom of religion for Christians. The city was a center of lyric opera in the late eighteenth century, and where La Scala became one of the most referenced theaters worldwide. Today it is the leading financial center and the most prosperous manufacturing and commercial city of Italy. Milan is one of the major financial and business centers of the world. Also it enjoys notoriety as one of the world capitals of design and fashion. It is a premier location for motorsport and football. Milan was the site of the 1906 World Exposition. In the early twenty-first century Milan enjoyed a resurgence in construction, preparing for Expo 2015 and continued economic growth. The Roman name Mediolanum includes the suffix -lanum meaning plain. Thus Mediolanum means in the midst of the plain. The German name for the city is Mailand, while in the local Western Lombard dialect, the city's name is Milán, similar to the French. Milan is located in the Po Basin of northern Italy, 400 feet (122 meters) above sea level. Toward the Alps to the north, the terrain is arid, while marshy groves and rice fields predominate near the Po River. Milan is classified as having a humid subtropical climate, with hot, humid summers with little rainfall and cool, damp winters. The average maximum temperature in July is around 82°F (28°C), and in January is 43°F (6°C). Snowfalls are relatively common in winter. Mean annual precipitation is 40 inches (1000mm). The city was typically often shrouded in the fog characteristic of the Po Basin, although the removal of rice fields from the southern neighborhoods, the urban heat-island effect, and the reduction of pollution levels have reduced this phenomenon in recent years, at least in the downtown area. The Olona river, the Lambro river, and the Seveso creek run through Milan—the Olona and Seveso run mostly underground. Santa Maria delle Grazie after the Anglo-American bombings in 1944. The settlement that was to become Milan was founded around 600 B.C.E. by the Celtic Insubres, for whom this region of northern Italy was called Insubria. Roman consul Gnaeus Cornelius Scipio Calvus led an attack on the Insubres and captured the city in 222 B.C.E. The Romans eventually conquered the entire region, calling the new province Cisalpine Gaul—"Gaul this side of the Alps"—and may have given the site its Latin-Celtic name—Mediolanum. After several centuries of Roman control, Milan was declared the capital of the Western Roman Empire by Emperor Diocletian in 293 C.E. Diocletian chose to stay in the Eastern Roman Empire (capital Nicomedia) and his colleague Maximianus the Western one. 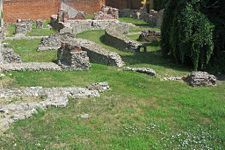 Immediately Maximian built several gigantic monuments, like a large circus (470 x 85 meters), the Thermae Erculee, a large complex of imperial palaces and several other services and buildings. In the Edict of Milan of 313, Emperor Constantine I guaranteed freedom of religion for Christians. Visigoths besieged the city in 402, and the imperial residence was moved to Ravenna. The Huns overran the city in 452, and in 539, the Ostrogoths conquered and destroyed Milan during the Gothic War (535–552) against Byzantine Emperor Justinian I. In the summer of 569, the Longobards (from which the name Lombardy derives) conquered Milan, overpowering the small Byzantine army left for its defense. Milan surrendered to the Franks in 774 when Charlemagne, in an utterly novel decision, took the title "King of the Lombards." Subsequently Milan was part of the Holy Roman Empire. Milan prospered as a center of trade due to its command of the rich plain of the Po and routes from Italy across the Alps. The war of conquest by Frederick I Barbarossa (1122-1190) against the Lombard cities destroyed much of Milan in 1162. Milan took the leading role in the Lombard League from its founding in 1167. 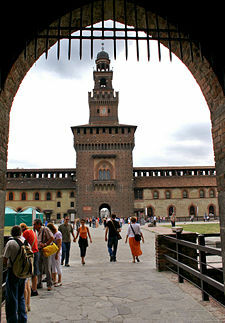 As a result of the independence that the Lombard cities gained in the Peace of Constance in 1183, Milan became a duchy. In 1208 Rambertino Buvalelli served a term as podestà of the city, in 1242 Luca Grimaldi, and in 1282 Luchetto Gattilusio. In 1395, Gian Galeazzo Visconti became duke of Milan. In 1447, Filippo Maria Visconti, Duke of Milan, died without a male heir; following the end of the Visconti line, the Ambrosian Republic was enacted. However, the republic collapsed when in 1450, Milan was conquered by Francesco Sforza, of the House of Sforza, which made Milan one of the leading cities of the Italian Renaissance. The French king Louis XII first laid claim to the duchy in 1492, when Swiss mercenaries defended Milan. The duchy was promised to Louis’s successor Francis I after his victory over the Swiss at the Battle of Marignano (1515). When the Habsburg Charles V defeated Francis I at the Battle of Pavia in 1525, northern Italy, including Milan, passed to the House of Habsburg. In 1556, Charles V abdicated in favor of his son Philip II and his brother Ferdinand I. Charles’ Italian possessions, including Milan, passed to Philip II and the Spanish line of Habsburgs, while Ferdinand’s Austrian line of Habsburgs ruled the Holy Roman Empire. In 1700, the Spanish line of Habsburgs was extinguished with the death of Charles II, sparking the War of the Spanish Succession in 1701, and the occupation of all Spanish possessions by French troops backing the claim of the French Philippe of Anjou to the Spanish throne. In 1706, the French were defeated in Ramillies and Turin and were forced to yield northern Italy to the Austrian Habsburgs. In 1713, the Treaty of Utrecht formally confirmed Austrian sovereignty over most of Spain’s Italian possessions including Lombardy and Milan. In the late eighteenth century, and throughout the nineteenth, Milan was an important center for intellectual discussion and literary creativity. Napoleon conquered Lombardy in 1796, and Milan was declared capital of the Cisalpine Republic. Later, he declared Milan capital of the Reign of Italy and was crowned in the Duomo. Once Napoleon’s occupation ended, the Congress of Vienna returned Lombardy, and Milan, along with the Veneto, to Austrian control in 1815. 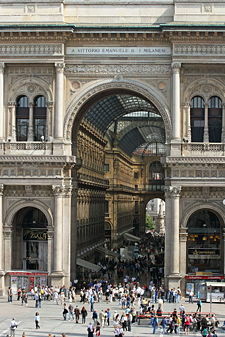 During this period, Milan became a center of lyric opera. There Mozart wrote three operas, and in a few years La Scala became the reference theater in the world, with its premieres of Bellini, Donizetti, Rossini and Verdi. On March 18, 1848, the Milanese rebelled against Austrian rule. Field Marshall Radetzky was forced to withdraw from the city. However, after defeating Italian forces at Custoza on July 24, 1848, Radetzky was able to reassert Austrian control. But Italian nationalists called for the removal of Austria in the interest of Italian unification. Sardinia and France defeated Austria at the Battle of Solferino in 1859. Milan and the rest of Lombardy were incorporated into the Kingdom of Sardinia, which soon gained control of most of Italy and in 1861 was rechristened as the Kingdom of Italy. After 1861, Milan lost its political importance, but it retained a central position in cultural debates. The political unification of Italy cemented Milan’s commercial dominance over northern Italy, and led to a flurry of railway construction that made Milan the rail hub of northern Italy. Rapid industrialization put Milan at the center of Italy’s leading industrial region. In May 1898, Milan was shaken by the Bava-Beccaris massacre, a riot related to a high inflation rate and famine. According to the government, there were 118 dead and 450 wounded after troops fired on protesters. 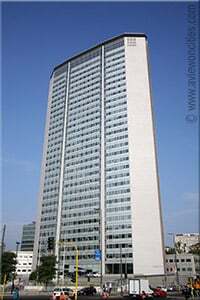 Meanwhile, as Milanese banks dominated Italy’s financial sphere, the city became the country’s leading financial center. 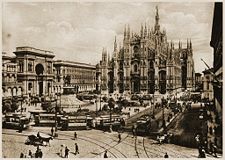 Milan’s economic growth brought a rapid expansion in the city’s area and population during the late nineteenth and early twentieth centuries. The Pirelli Tower, a symbol of the post-war economic boom. In 1919, Benito Mussolini organized the Blackshirts, who formed the core of Italy’s Fascist movement, in Milan. In 1922, Mussolini began his March on Rome from Milan. During World War II, Milan sustained severe damage from British and American bombing. Even though Italy quit the war in 1943, the Germans occupied most of northern Italy until 1945. Some of the worst Allied bombing of Milan was in 1944. Much of the bombing focused around Milan's main train station. In 1943, anti-German resistance in occupied-Italy increased and there were explosions in Milan. As the war came to an end, the American 1st Armored Division advanced on Milan as part of the Po Valley Campaign. Before they arrived, members of the Italian resistance movement revolted and liberated Milan. Nearby, Mussolini and several members of his Italian Social Republic were captured by the resistance at Dongo and executed. On April 29, 1945, the bodies of the Fascists were taken to Milan and hung unceremoniously upside-down at Piazzale loreto a public square. After the war, the city was the site of a refugee camp for Jews fleeing from Austria. During the 1950s and 1960s, thousands of Italians, particularly from Southern Italy, moved to Milan to seek jobs within the city’s rapidly expanding economy. The population peaked at 1,723,000 in 1971. From the 1980s, Milan attracted numerous foreign immigrants. Chinatown, a district established in the 1920s in the area around Via Paolo Sarpi, by a group of Chinese people from Zejiang, greatly expanded to become a most picturesque district. Much of Milan's population, during the 1970s and 1980s, moved to the belt of new suburbs and small cities surrounding Milan, although Milan’s population seems to have stabilized, with a slight increase in the population of the city since 2001. 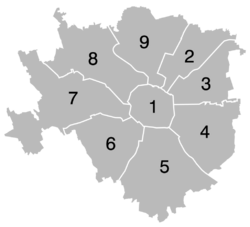 The nine boroughs of Milan. The city, or comune, of Milan is the capital of the Lombardy region, which is one of Italy's 20 regions, and of the province of Milan. Italy's 100 provinces have their own local elections. Each province has a prefect who is appointed by and responds to the central government, which he locally represents. 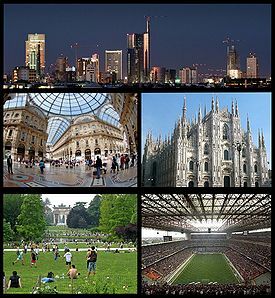 The city of Milan is subdivided into nine administrative zones, called Zona. The Zona 1 is in the historic centre - within the perimeter of the Spanish-era city walls, the other eight cover from Zona 1 borders to the city limits. 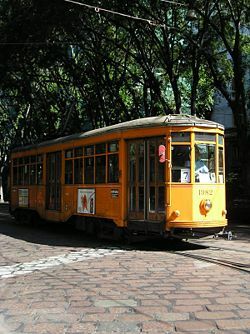 The classic trams from the 1920s are still in use. Airwiew of Malpensa International Airport. It handled more than 23.8 million passengers in 2007. Milan is one of the major financial and business centers of the world. It was ranked at number eight among Global Network Connectivity Rankings of U.S., European Union, and Pacific Asian Cities by the Brookings Institute. Milan was listed as having the 40th largest gross domestic product in the world in 2005, at US$115-billion. Per capita GDP was US$48,300. The city is the seat of the Italian Stock Exchange (the Borsa Italiana). "Piazza Affari" and its hinterland is an avant-garde industrial area. Milan is also well-known as the seat of the Alfa Romeo motorcar company; for its silk production; and as a world center for fashion design. Redevelopment has made FieraMilano - the city's Exhibition Centre and Trade Fair complex in the northwestern suburb of Rho, opened in April 2005 - the largest trade fair complex in the world. In 2008, Milan was in a significant architectural and urban design renaissance. Numerous construction projects aimed to rehabilitate disused, peripheral industrial areas. Projects included: The addition to the Teatro alla Scala; the new quarter Santa Giulia; and the Porta Nuova project in the Garibaldi-Repubblica zone, which together would give Milan a skyline no longer dominated by the Duomo and the Pirelli Tower. This redevelopment was to continue until Milan hosts Expo 2015. 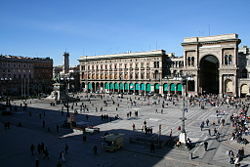 Milan is the second railway hub of Italy, and the five major stations of Milan, including the Milan Central station, are among Italy's busiest. The first railroad built in Milan, the Milan and Monza Rail Road was opened for service on August 17, 1840. Milan has three subway lines, with 50 miles (80km) of track, and a light metro-service connecting the San Raffaele Hospital with the Cascina Gobba station. Greater Milan has an extensive tramway system, with more than 178 miles (286km) of track, and 20 lines. Milan also has four trolleybus routes, and included in the fleet are 10 air-conditioned Cristalis trolleybuses. Currently 93 bus lines cover more than 664 miles (1070km) between them. Milan has a privately operated taxi service. 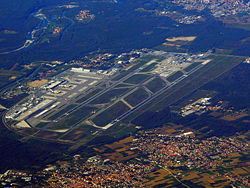 Malpensa International Airport is located near the industrial towns of Busto Arsizio and Gallarate. Milan also has the Linate Airport within the city limits (for European and domestic traffic), and Orio al Serio Airport close to the city of Bergamo. The city proper (Comune di Milano) had a population of 1,338,436 inhabitants in 2011. The official population figures of the Milan metropolitan area was 3,076,643 residents, making it the second largest in Italy after Rome. As of 2006, the Italian national institute of statistics ISTAT estimated that 292,204 foreign-born immigrants live in Milan Urban Area, equal to nine percent of total population. 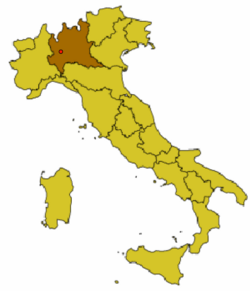 In addition to Italian, approximately a third of the population of western Lombardy speak the Western Lombard language, also known as Insubric. In Milan, some residents can speak the traditional Milanese language, which is the urban variety of Western Lombard, and which is not the Milanese-influenced regional variety of the Italian language. Milan's population, like that of Italy as a whole, is overwhelmingly Roman Catholic. 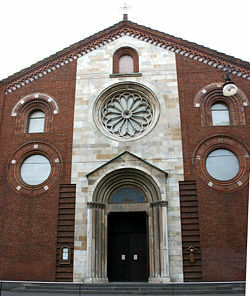 It is the seat of the Roman Catholic Archdiocese of Milan. Other religions practiced include Buddhism, Judaism, Islam, and Protestantism. Milan has its own historic Catholic rite known as the Ambrosian Rite, which varies slightly from the Catholic rite, with some differences in the liturgy and mass celebrations, and in its calendar. The Ambrosian rite is practiced elsewhere in Lombardy and in the Swiss canton of Ticino. Liturgical music differs, since the Gregorian chant was not used in Milan because its own Ambrosian chant, established by the Council of Trent (1545-1563), and earlier than the Gregorian , was used instead. The unique schola cantorum has emerged to preserve this music. 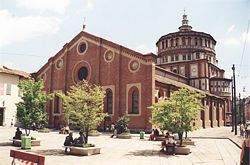 Milan is home to numerous universities and other institutes of higher learning. State universities include the Università degli Studi di Milano, and the University of Milan Bicocca. Science and medical universities include Vita-Salute San Raffaele University, and Tethys Research Institute. The Politecnico di Milano and Statal University teach architecture and engineering. Business, economics and social studies are taught at Bocconi University, Bocconi, and Università Cattolica del Sacro Cuore. Language, art and music are taught at La Scala, Brera Academy, and IULM University, among others, while fashion and design are taught at Domus Academy, Istituto Europeo di Design, and Istituto Marangoni, among others. Milan has its own regional cuisine, which includes "cotoletta alla milanese," a breaded veal cutlet pan-fried in butter, cassoeula, which is stewed pork rib chops and sausage with Savoy cabbage and tomato sauce, ossobuco (stewed veal shank with tomato or lemon sauce), risotto alla milanese (with saffron, white wine and beef marrow), busecca (stewed tripe with beans and tomato sauce), and brasato (stewed beef or pork with wine and potatoes). The best known Milanese cheese is gorgonzola from the nearby town of that name. Football is the most popular sport in Italy, and Milan is home to two world-famous football teams: A.C. Milan and Internazionale. The city hosted the FIFA World Cup in 1934 and 1990, the UEFA European Football Championship in 1980. The famous Monza Formula One circuit is located near the city, inside a wide park. It is one of the world's oldest auto racing circuits. The capacity for the F1 races is currently around 137,000 spectators. Milan and Lombardy are official candidates for the Summer Olympic Games of 2020 ("Milan-Lombardy 2020"). Teatro alla Scala. Milan is also one of the most important centers in the world for Opera lirica, with his famous Teatro alla Scala (La Scala). The Pinacoteca di Brera, Pinacoteca Ambrosiana, Poldi Pezzoli, the Bagatti Valsecchi Museum and the Musei del Castello galleries, which host a great number of pictorial masterpieces, statues, Egyptian antiquities, and early Christian works. Milan's geographic location within Italy makes it the nation's most important economic center. It is strategically situated at the center of the traffic routes of the Val Padana and lies on the borderline between the advanced agriculture of the south and the limited agriculture of the north. The city also has highly developed industry and an extensive network of road and rail communications, giving it an economic advantage over other less-developed Italian cities. Its infrastructure contains railroads that are carefully integrated within its landscape. 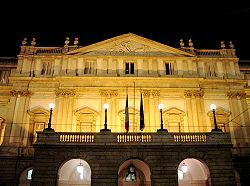 It was a center of lyric opera in the late eighteenth century, and La Scala became the reference theater in the world. It remains a city of culture today. It is also one of the major financial and business centers of the world, is one of the world capitals of design and fashion, and is a premier location in the worlds of motorsport and soccer. Milan is an industrious and vital city, which in 2008 was in a long phase of reconstruction in preparation for Expo 2015 and further economic growth. ↑ Milan ItalyTravelsGuide.com. Retrieved May 17, 2012. ↑ 2.0 2.1 City population (i.e. that of the comune or municipality) from ISTAT, Demography in Figures. Retrieved May 17, 2012. ↑ Peter J. Taylor and Robert E. Lang, February 2005, U.S. Cities in the 'World City Network' The Brookings Institution. Retrieved October 28, 2008. ↑ Joseph Otten, Catholic Encyclopedia, 1907 ed., Ambrosian Chant newadvent.org. Retrieved October 28, 2008. Eurostat. Milano Retrieved October 28, 2008. This page was last modified on 5 October 2018, at 14:56.